November media attention to climate change and global warming was up just slightly (3%) throughout the world from the previous month of October 2017. Increases were detected most strongly in Asia, the Middle East, Africa and Europe, with a decrease in Oceania and counts holding steady in the Americas. Compared to counts from fifty-two sources across twenty-eight countries in seven regions around the world in November 2016 (a year ago), the global numbers were actually down about 23%. The high levels of coverage in November 2016 were largely attributed to the US Presidential election of Donald J. Trump and the concatenate Marrakech round of international climate negotiations (COP22). While this November was punctuated with the Bonn round of climate talks (COP23), it did not prove to be nearly as resonant a media event-come-story as those that unfolded in the previous November. At the country level, coverage was also up from the previous month of October 2017 in Germany (17%), India (21%), Spain (8%), the United Kingdom (UK) (14%), and the United States (US) (2%). Coverage was down in Australia (-39%), Canada (-7%) and New Zealand (-29%). Figure 1 shows these ebbs and flows in media coverage - organized into seven geographical regions around the world - from January 2004 through November 2017. Figure 1. Media coverage of climate change or global warming in fifty-two sources across twenty-eight countries in seven different regions around the world, from January 2004 through November 2017. Figure 2 shows word frequency data at the country levels in Australia, New Zealand, Canada, the USA, Germany and the UK in November 2017. The five representative US sources showed continuing signs of a 'Trump Dump' (where media attention that would have focused on other climate-related events and issues instead was placed on Trump-related actions (leaving many other stories untold)). However, this pattern of news reporting appeared limited to the US context (as was the case in the previous month). In US news articles related to climate change or global warming, Trump was invoked 2816 times through the 280 stories this month (a ratio of over 10 times per article on average) in The Washington Post, The Wall Street Journal, The New York Times, USA Today, and the Los Angeles Times. However, in contrast in the UK press, Trump was mentioned in the Daily Mail & Mail on Sunday, Guardian & the Observer, the Sun, the Daily Telegraph & Sunday Telegraph, the Daily Mirror & Sunday Mirror, the Scotsman & Scotland on Sunday, and the Times & Sunday Times 724 times in 566 November articles (a ratio of just over one mention per article on average). These stories led into wider considerations of attention paid to political content of coverage during the month. In this arena, coverage of the November 6-17 international climate talks in Bonn, Germany (COP23) dominated news attention. Of note, Doyle Rice in USA Today reported on November 7th that Syria's move to join the Paris Agreement meant that the USA Trump Administration would become the one nation on earth to not be a part of the international climate agreement, once the US fully moves out of the accord. Also, later in November, news stories covered how the US Environmental Protection Agency held its only public hearing on replacing the Clean Power Plan in Charleston, West Virginia, an area considered 'the heart of coal country'. John Schwartz from The New York Times reported on November 28th of hours of emotional testimony from a range of stakeholder and interest groups during the hearing. Media accounts also focused on scientific dimensions of climate change and global warming. For example, the US Global Change Research Program Report release by thirteen US agencies in early November (with findings at odds with the stance of the Trump Administration) generated coverage. Brady Dennis, Juliet Eilperin and Chris Mooney from The Washington Post wrote a November 3 story entitled "Trump Administration Releases Report Finding 'No Convincing Alternative Explanation' for Climate Change", naming human activity as the dominant driver of contemporary climate change. The authors stated that this is "a conclusion at odds with White House decisions to withdraw from a key international climate accord, champion fossil fuels and reverse Obama-era climate policies". Figure 2. 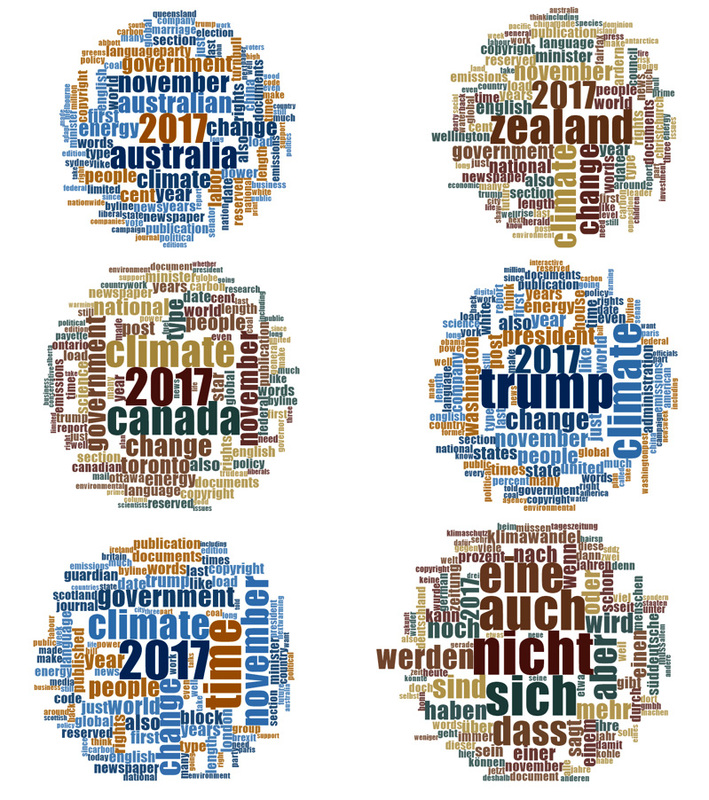 Word clouds showing frequency of words (4 letters or more) invoked in media coverage of climate change or global warming in Australia (top left), New Zealand (top right), Canada (middle left), the United States (middle right), the United Kingdom (bottom left) and Germany (bottom right) in November 2017. In English these are articles containing the terms 'climate change' or 'global warming'; in German, these are articles with the terms 'klimawandel' or 'globale erwärmung'. Across the globe in November there were a range of stories that intersected with the cultural arena. For example, Lisa Friedman from The New York Times wrote on November 11th about the #WeAreStillIn social movement afoot to express commitments to reduce greenhouse gas emissions as local and regional scales while offsetting the lack of commitment to mitigate climate change in the US Federal government. 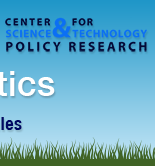 In November, coverage relating to ecological and meteorological issues grabbed attention. There were a number of stories like a November 6th piece by Fiona Harvey in The Guardian that related news that the World Meteorological Organization announced that 2017 was on track to become one of the top three hottest years on record (along with 2015 and 2016). In addition, stories continued to cover connections between climate change and extreme events, documenting Puerto Rico's continued challenges to recover from hurricane Maria two months after the storm passed over the island. One story by Milton Carrero Galarza and Kurtis Lee from The Los Angeles Times documented how thousands of residents have begun to migrate to the US mainland. Hope nonetheless springs eternal as we head into the final month of 2017. Have a happy December!